Note: Podcast being processed. Podcasting permission granted by presenter. Kristin Michell (the presenter), Director of Technical Assistance, was kind enough to send me a note yesterday. Her presentation style was quite vivacious and engaging. Thanks for attending and blogging about my session yesterday, it was nice to meet you. I wanted to send two resources per our discussion of online professional development and online learning yesterday. First, I wanted to share the ED-Funded evaluation that was conducted by Mathematica which looked at Ed Tech across over 15 instructional technology interventions for students – it is the large scale study I mentioned yesterday. In this document we featured the Maryland Public Television program and the specific unpublished research by Helene Jennings and Michael Long at ORC Macro is attached. Their paper was presented at the 2004 American Evaluation Association conference. The evaluation about the Louisiana Online Algebra I program is also included in the publication. Hope these research resources are helpful. Please let me know if you have any additional questions or need any other information! offers funding and is an independent research entity that provides best available research. Reading content has lots of research, while Math may not be researched. We can research to existing or current research studies and how you can use that evidence. Where there is not a research, we can work with you as a District to design an evaluation to the body of evidence that exists. Spend 25% of dollars working on rural issues. First report ever done was about rural. 6 commonly used definitions of rurality and they greatly affect funding. Research Ready Source – our reference desk service. Greatest level of interaction. Email or call us with a request and we have operators standing by. Quick Reviews: Every week there is a study…REL/WWC work together to review research studies that appear in the media. Content centers disseminate knowledge on scientifically based research on effective practice and research-based products in their area of specialty. I’ll still post stuff here, but you can get it fresh at the link above as it happens. Note: Podcast permission has been granted by presenters. Listen to “Online On-Time: Making the New Media Work for You. Hi! Thanks for listening to this Around the Corner podcast. Today is Thursday, January 29, 2009. This is your host Miguel Guhlin. Over the last few years, I’ve been sensitized to the power of social media–blogs, wikis, podcasts, content management systems–and the ways they enhance how we communicate, collaborate, and human creativity. For many school districts, however, social media is a threat to the very way they do business. If employees choose to use social media, they often do so at their peril, facing the challenge of over-turning misconceptions that have sprung from negative news stories by traditional media such as televisions and newspapers. This audio recording of a presentation delivered at the 2009 TASA Midwinters Conference for administrators. It caught my eye because it approaches using new media in a pro-active way, an attempt to control how media is used. As I listened to this presentation, it occurred to me that it is a mirror of how school districts first begin to try and control social media and manipulate it for their own purposes. I was inclined to dismiss this presentation for exactly that reason until it occurred to me that this podcast serves as a perfect reflection of the reality of school districts grappling with an issue, however imperfectly. New media and put this info in the tool bag. Kari Hutchison in Comal ISD. Brad Domitrovich (Bandera ISD). Is your logo part of your marketing? Provides a vehicle to dispel myths and rumors – timing is everything. How do you communicate message? Listening is the key – being good listeners and paying attention and caring about people. Traditional communication tools have a limited life and as such are limited relationships. Even public meetings…a meeting tonight about boundaries is limited to that room right there. Use blogs to get your message–especially about controversial issues–out there to the public. CIPA, FERPA impact school district’s embrace/acceptance of these tools. Remember who can see your post: Your mother, your students, your community members, your superintendent/board president, the editor of the Dallas Morning News. unlike traditional communication tools, social media involve unlimited life, unlimited relationships. As administrators, we have to remember that we can’t control it…we cannot control social media 100%. We’ll have to participate but we need to tell parents that we are limited by laws. Galveston ISD uses twitter during the height of the hurricane. Note: Please find my notes on the session below. They are imperfect and will contain typos. Sitting here listening to Friendswood High School Choir right before the Opening General Session: Dan Pink session. I managed to find a seat directly in front of the speaker’s podium, so have a great view of the stage and hope my battery lasts on the laptop. In the meantime, the Friendswood High School Choir is doing a wonderful job! Since I had a teen in choir at middle school, I have an idea of how much practice went in to get ready! “Repetition is an effective form of emphasis,” said Dan Pink’s old English teacher. I want to talk about the economy and education, but some stipulations: 1) I am not an educator, not a teacher, principal, superintendent, school board member. I study organizations and how people work within organizations. Anything valuable I have to say I say….2) The purpose of education, public education, is not to deliver employees to employers. Purpose is much broader, more important…full participation in a democratic society, allow each kid to reach their full potential. That’s the part of the conversation that dominates. If we can win that conversation, we can do right by our kids. “We need to prepare kids for their future, not our past.” I’m going to use this as the fulcrum to discuss education and the economy. Let’s go back to my past, late 1970s. I grew up in Columbus, Ohio. That was the sound of one hand clapping. ..the singular form of applause, a plause. Middle class family, had the every boy experience. Advice went like this: Get good grades, go to college, pursue a profession that gave you a good income. I followed that advice…I did go to law school. In the interests of transparency…I didn’t do well in law school. I graduated in the part that made the top 90% possible. The final 3rd of the 20th century…certain abilities that gave you the opportunity to get a job. Our brains are divided into two hemispheres. Lots of stupid stuff about left and right brain. The science has become to catch up thanks to all sorts of technologies. Our brains are really complicated. In a broad toplogical level…our brains have divided up into different sets of tasks. Metaphor: It was the left brain that employers wanted and that schools were designed to bring to the surface. Those kinds of left-brain abilities that made the whole brain go around. The SAT spreadsheet abilities…those are necessary. The left brain spreadsheet, linear, logical abilities are 100% necessary (x3). You must have them, they are indispensable…BUT…they are not sufficient. 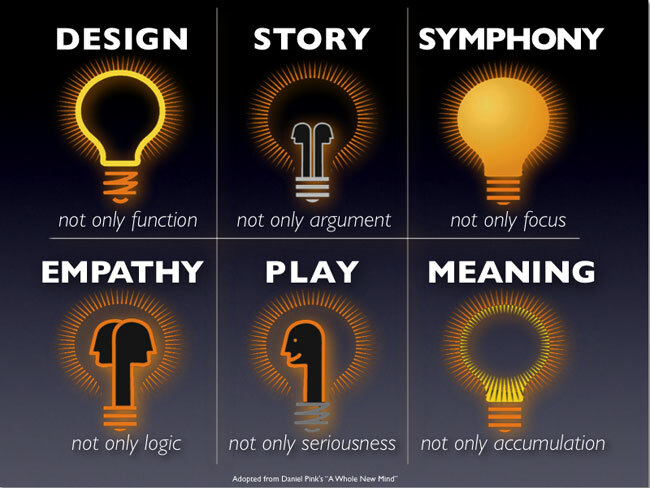 Abilities for the right brain…artistry, empathy, big picture thinking that matter most economically. Think about our past and kids future, that is the dividing line. If this is right–and I’m convinced it’s more right than wrong–then…. This is not a prescription or recipe for a better America…this is an argument. I’m a very left-brain guy, I’m very linear, sequential, love data, quantitative, I love charts-n-graphs. globalization, flattening world…85% of India is left behind, but what remains (150 million) is more workers than what we have in the U.S. India will be the largest English speaking country next year. English has become de facto language…. Cost of communication is ZERO. Here’s the effect: today, 1 word has become a death sentence in the economy. Scariest word: ROUTINE. Any work that is routine is disappearing from this country. If you can write down the steps, then that work races over fiber-optic cables somewhere else. Following a set of steps and getting a right answers…certain kinds of work is routine. If it’s routine, it’s a goner. We’ve seen this movie before. Routine mass production work has left the U.S. That kind of work is not coming back. The U.S. has the largest manufacturing economy. Routine white-collar work is disappearing. Left brain work is being off-shored…our kids won’t be doing routine white-collar work than we are doing blue-collar work. Automation…software is replacing our brain. What part of the brain is being replaced? The logical, linear, rule-based side? Software is doing to our brains what machines did for our backs. CompleteCase.com – affordable divorce solutions. Don’t let the current bad economy fake us out. But it’s not going to stay permanently down. The trend is towards greater and greater material abundance. appear in 88% of households. Phones have more computing power than existed. Color televisions are in 98% of homes. No company has ever “cut” its way to success, only innovated to success. We think it’s all about high tech. What really matters is high concept and high touch. Hard to outsource, hard to automate, hard to reduce to lines of code, non-routine abilities…. I want to anticipate a question: What about STEM? I am worried about how we talk about STEM in this country. This is enormously important. These are disciplines about curiousity, big thinking, not about turning kids as vending machines for right answers. Google: successful high tech companies. What do you look for? Your high tech STEM company? In awe of educators for pushing that boulder up the mountain. Novelty, Nuance, and customization are the watchwords of business today. In schools, move towards routines, right answers and standardization. at precisely the moment when the economy is not about that. Design – fundamental business literacy. Want our kids to be design thinkers. Elegant way to solve problems. Empathy – hard to outsource or automate. Metrics matter…Jefferson Scale of Physicians’ Empathy (JSPE). Higher the empathy score, the more likely your patient will get better and have lower scores. Symphony: see big picture, combine disparate things into something new. In addition to analytic skills, which are well provided by the current education systems, companies want engineers with passion, life-long learning skills, systems thinking, an ability to innovate, an ability to work in multicultural environments, an ability to understand the business context of engineering, interdisciplinary skills, communication skills, leadership skills, and an ability to change. Note: Podcast now available at the link below. Check back. Lots covered that didn’t appear in notes…any errors/omissions in the notes are mine, not the speakers’. LOTS of info shared. I’m sitting waiting for the next session to start at the TASA 2009 Midwinters’ Conference. The session is entitled Hurricane Ike Disaster Planning and Recovery- A Case Study, Cypress-Fairbanks ISD. What a joy it is to see old acquaintances, Dr. David Anthony and Harold Rowe. Dr. Anthony was my superintendent in Mt. Pleasant ISD and I still remember his fiery red hair and motivational speaking abilities. Dr. Anthony is speaking…I’m going to get this started and let competent people do the presentation. I’m joined today by Harold Rowe (Assoc. Supe for Tech and School Services), Pam Wells (Assoc Supe for Construction and Community Partnerships), Tony Barcelona, Roy Sprague (Asst. Supe for Construction). These 4 people were integral to the response that we had for Hurricane Ike. Dealing with an issue that had terrific magnitude, but not the same…we were 100 miles inland…involved recovery, repatriation, lost 7 instructional days and staff days. You have to respond and have a disaster recovery, and implement short-notice. A lot of folks got lulled to sleep. 800,000 people…have 100,000 kids. Communication was an issue. One of those things that you learn the hard way, and want to share those lessons. $27 billion in damages in U.S. Minimal roof damage considering the winds we had. **Plan for alternate location as command post. **Meeting with District Leadership Team, including central office folks and more. *Utilized security dept and law enforcement service to provide initial assessment of damage during and immediately after storm…a list was formulated and shared immediately when everyone got together. *Contacted/assembly of architects, contractors, consultants and other service providers for support. *Obtained authorizationa nd delgation to get things going…critical component and do it legall. Board Agenda suggested wording: The board of Trustees will consider authorizing the supe or his designee to engotiate and execute any and all agreeements, contracts, and /or purchase orders necessary to remediate and/or repair damage to District property, personal property andor infrastructure caused by Hurricane Ike, and to seek on district’s behalf and and all insurance proceeds…. *Damage inspections of all facilities and grounds were done. *Roof consultants performed initial damage assessment of all roofing systems. *Damage reports were inputted by clerical staff into template. Put all these elements on a form across the top, schools down the left. **Determination of route times. Covered with buses and drivers to get students to and from school. **Frequent communication – cell network capacity is a big concern. Use NextTel push to talk or satellite phones. **Board resolution – pay staff members even though they may not have worked. There is a way to do this. Make sure we can get people to work when we have an emergency…has double-time been done before? Decided to do this just for this time. That was part of the resolution. **Use of color stickers on hurricane purchase orders to distinguish from normal issues Purchase Orders. Put a plan in place and then run practice drills. Q: Mandatory group that stays in place? R: Disaster recovery team stays at facilities. I’m sitting in at the TASA 2009 MidWinters’ Conference in Austin, Texas, waiting for the Reinventing Learning session to start in about 38 minutes. The session facilitators are Jeff Sharp (Creativity Director…jsharpe@shwgroup.com) and Shannon K. Buerk, Director of Cambridge Strategic Services (sbuerk@cambridgestrategics.com). More at their web site at http://www.cambridgestrategics.com and, I can’t help but notice they also have a blog. Where do you go to learn? to deal? to feel? …what does that look like? My response to the question is pretty different than what it was a few years ago. In the early days, my focus was on learning via magazines, inservice sessions and conferences. Now, learning happens pretty much at any time, anywhere. If I have a question, I google it, sure in the knowledge that someone else has already considered it. On the rare occasions that I can’t find the answer–of if it takes me a long time to find an answer buried somewhere–then I take it upon myself to share the process and response via a blog. I suppose, my interpretation of this question was entirely ONLINE. And, I don’t think I’m alone in considering online learning spaces rather than face to face…it’s like The Matrix, where the reality is terrible but the virtual is wonderful to learn in (I’ll stop with the simile there). How can we create virtual learning spaces that do what these facilitators suggest with physical space? Are there different factors or are they the same? Where do you go when you need to concentrate? What does that space look like? Smell like? Sound Like? Taste Like? Discuss: How are your environmental preferences different from your kids? Or your grandkids? How are those preferred environments different from the traditional classroom? The following are Miguel’s notes on this presentation on Monday, January 26, 2009 at the TASA MidWinters’ Conference. Good morning, I’m Shannon Buerke. . .I do strategic planning facilitation. I also do transformation of learning environment, working with facilities and architects, redesign the environment to meet the needs….I’m Jeff Sharpe…bring thoughts and research and creativity and merge that with the physical environment. The environment is a tool for collaboration. Over the past 20 years, I have been a teacher, curriculum director, consultant, assistant superintendent for instruction, and associate superintendent. I have facilitated a number of initiatives in a number of districts that have purported to have positive impact on students. More recently, I have worked on a number of projects spread across the globe that are also expected to have a dynamic impact on students. I felt like I knew the answer to the question of the purpose: to help each child reach his/her own full potential …to free them to create their own future… or something like that. For a minute, think about why you chose this session…why did you come and what do you want to get out of this session? How to change old spaces into a new learning environment without building a new building. More ideas for engaging students with the learning environment. Some things we’re going to talk about…it’s what you can do inside a building. We’re trying to focus on things that are cheap and easy but that have a big impact. I want to tell you why we care about this stuff, factors you can look at, what we need to address. Shannon’s story began with a group of students who had failed the TAAS…kids couldn’t graduate if they didn’t pass it. 25% of the graduating class was in danger of not graduating. When I walked in the room, I inherited, it was a very traditional room. Not very welcoming and I’d had some learning styles training. ..what can I do? Change the design of the room, the lighting, get comfortable seating, allowed students to listen to Walkmans, and went through that semester and had phenomenal results on the test! Then I went to address that in AP English classes, junior college, being sensitive to what’s happening in the environment made a big difference for students. We sometimes take this for granted and don’t pay attention to it. It really works now in the role that we work in together. I believe in that power of the environment. Jeff’s Story: I come from an academic environment…create environments for people to discover their voice, and be creative. In the end, it’s about discovering the tool where we bridge about notions of learning, creativity, collaboration and how the physical environment bridges those. We bring those together as those become a manifestation of both of those. How does your kids or grandkids environment differ from yours? How do those environments differ from the traditional classroom? If you can choose, create the environment, how can we manipulate the environment to match? What we know is that the environment impacts us spiritually, intellectually, emotionally…our memory is connected to place. What we really talk about and investigate is what that means to all people, how do you create a tapestry of all people, where is that place where learning happens? An effective learning environment provides for all …it amplifies and engages, it is visceral. design how spaces should act, rather than how they should look…this doesn’t mean they shouldn’t be beautiful as well. Need to do this within set budgets and constraints…think of spaces you are in control of. How can you reinvent those spaces? There are not a lot of quick fixes, they take energy, time, training…you don’t have to spend a lot of time training people. We invite you to think about how you can reinvent the learning environment. -Focus Mode – Light can focus attention…. The intersection of color and light…take colored transparencies…they can be used to increased student reading fluency…it changes the way light is filtered. Black on white is the hardest to process for the human eye. Accentuating the red end of the light spectrum at a workplace increases a person’s pulse and breathing rate, accentuating the blue end the reverse effect takes place. Blue light research: blue light rasies serotonin and suppresses melatonin, therapeutic use of blue light for treating winter depression and circadian disorders, aging eyes respond well to blue light. Sounds enable instant memory recall. Marketing people understand this due to the ditties that get stuck in our head. Great for setting the mood. With kids hooked up to iPods all the time, there is a retreat to fight or flight. THe brain is not able to process in the frontal lobes. Quite a bit that shows that the types of sound can make a difference in how students are able to process. [Listening to music clips in the session] Be aware of how it makes you feel differently. I’m not saying its appropriate for children to listen just to their music in a room…but rather that sound is important. Quietness is more distracting and louder. [tapping on the desk] Kids will often create their own white noise to take control. We are sending a message when we walk into a classroom…you’re going to learn by yourself, you’re not encouraged to interact with people around you. When you put those bodies where the body weight is centered on a few inches of bone. Learners need to move when the time equals your age. Students need to move…cerebral spinal fluid. CSF can only bring and dump the waste [wow, I had no idea!!] but in the classroom, that’s not the case. Furniture can make a difference. Furniture…flexibility and fluidity. It’s important to be able to reconfigure space. and be able to slide chairs/desks around. In the UK, transforming the learning environment–physical space–but if you put the wrong furniture in a room, you’re back to a mindset that reflects how teachers and students work together with each other. TEA does not have a rule about desks/chairs to be used in a classroom. What technology does a child have now that you didn’t have before? if you think about the devices, they have quite a bit of flexibility. Students also have smart devices to jump out and get information…they have blurred environments, “power-down” and “unplug” and focus on this one person who will be the keeper of all knowledge. How can we enable collaboration? How do you capture+share knowledge? You never lose the energy of collaboration and sharing. Chalkboard paint can allow sharing and collaboration. We think through writing…create this idea of learning on display. Bringing common laptops that interface on the screen. CityWall is a large multi-touch display installed in a central location in Helsinki which acts as a collaborative and playful interface for the everchanging media landscape of the city. The new interface launched in October 2008 also allows working with 3D objects, which enables multiple content and multiple timelines. Think about things outside what you know of education. How can peer-to-peer learning happen in your spaces? Outside the classroom…create spaces that are sticky, so that kids can stay there and relax between classrooms. Use archives and exhibit of a school as a definer of a place. Make the display more purposeful and well-designed. Transforming a space in Coppell ISD, how to create a different learning environment…found this replicable concept. We went into a lot of classrooms around the U.S….regardless of the structure, when we walked in, it was still the same type of student/teacher role with unengaged students. In New Tech HS, the kids were engaged because they were driving the learning. We tried to create a space to support project-based learning, students driving the learning from a problem. Students, when walking into these environments know something different is happening, but working with staff to change their mindsets…please speak to that. R: Make sure the environment is flexible that some things can still happen the way teachers function…culture is set when you walk into the building. Create an owner’s manual. Work with teachers about how to use these learning spaces and evolve that [imagine doing this with virtual learning spaces]. This notion of institutional evolution…to the people in UK, rebuilt schools, fixed them up a bit and haven’t done much since. So one of the biggest factors, how do you create agile learning environments that evolve? Creating an environment that evolves with the institution. Q:When you begin to design the space, how do you design a space that considers different learning styles? What factors? R: Level the playing field, making sure there was enough variety in there to match various preferences. Think about what your first step is…what are you going to do next?